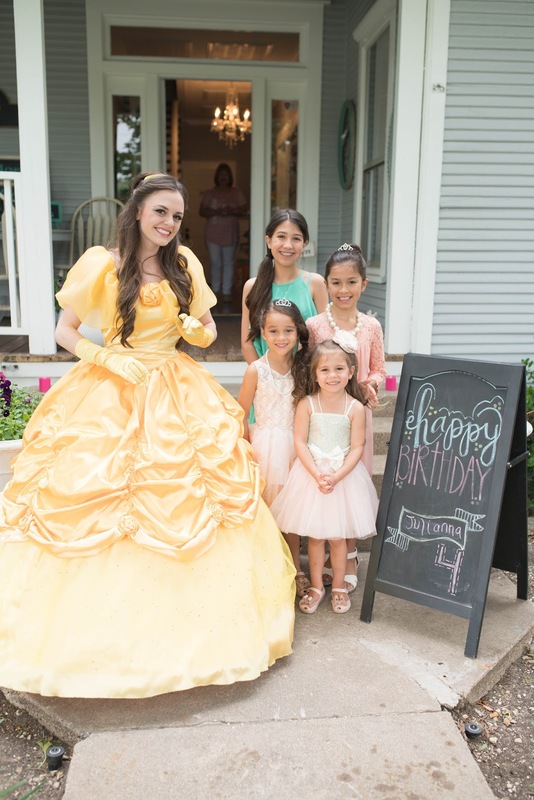 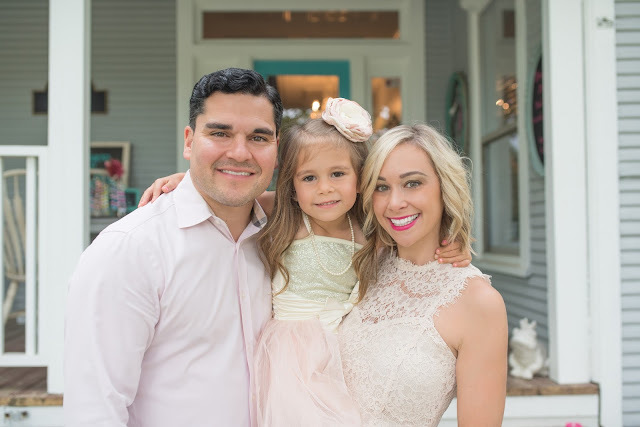 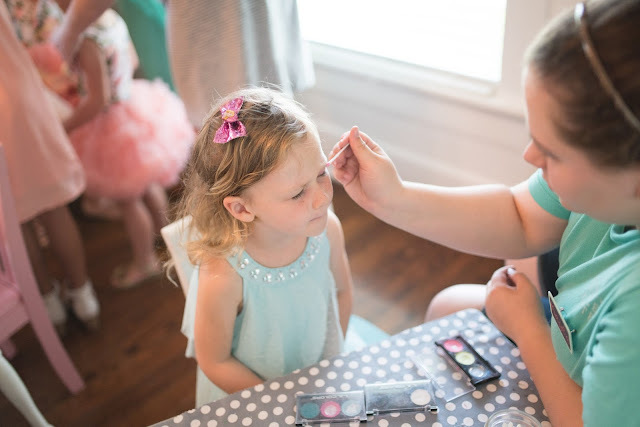 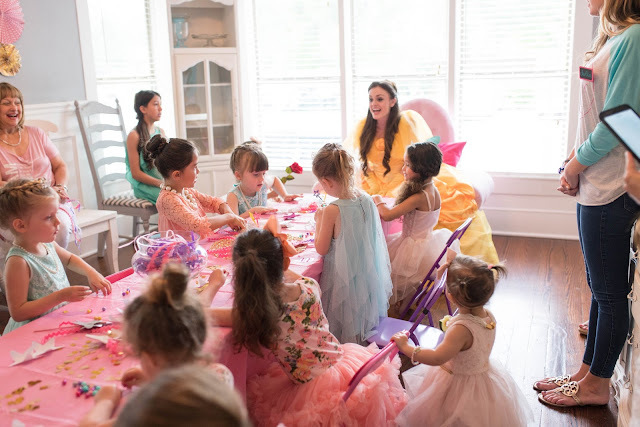 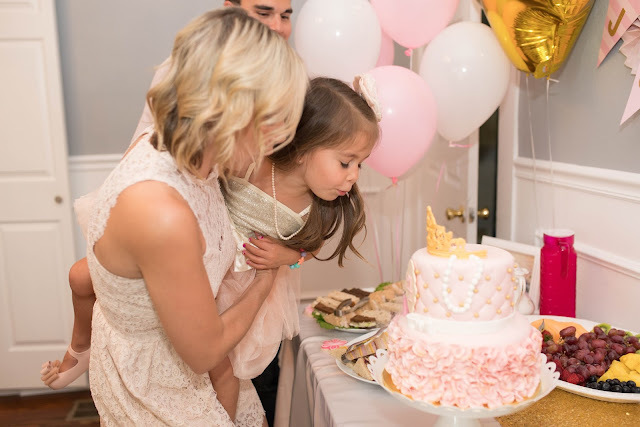 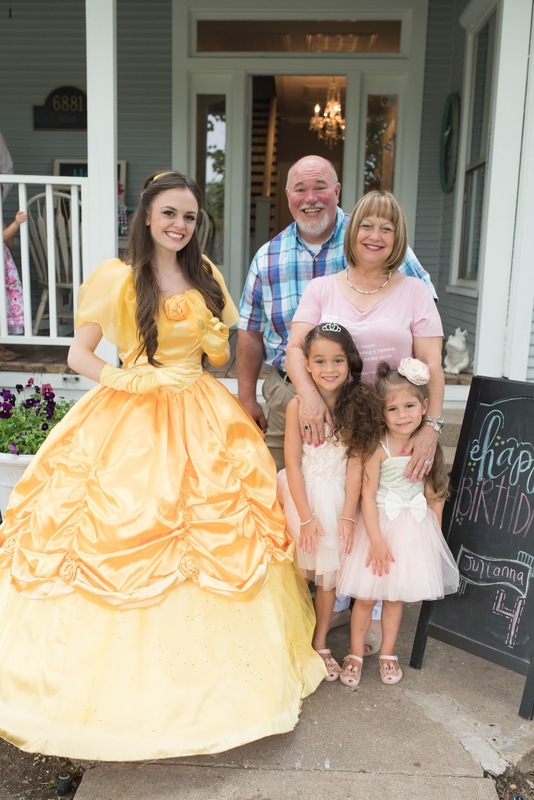 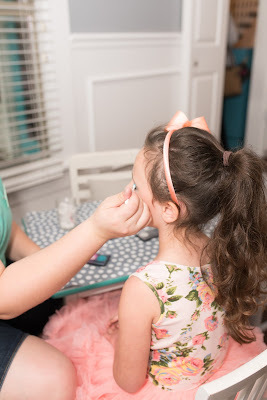 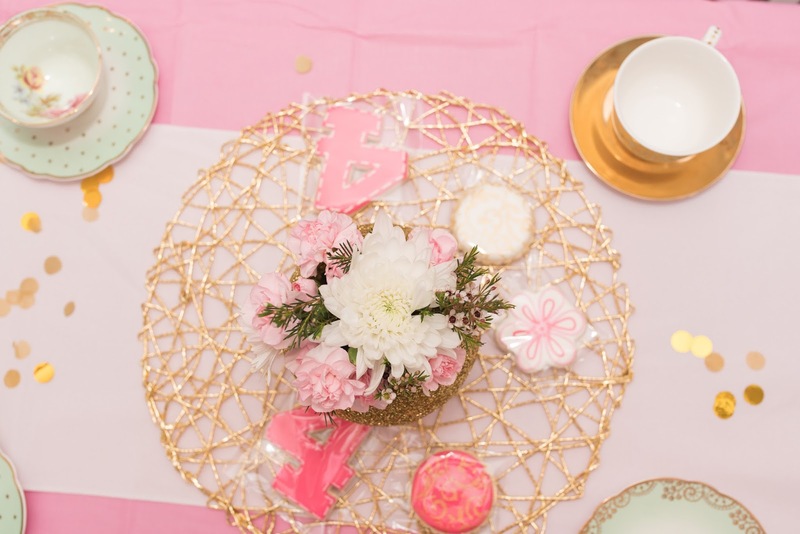 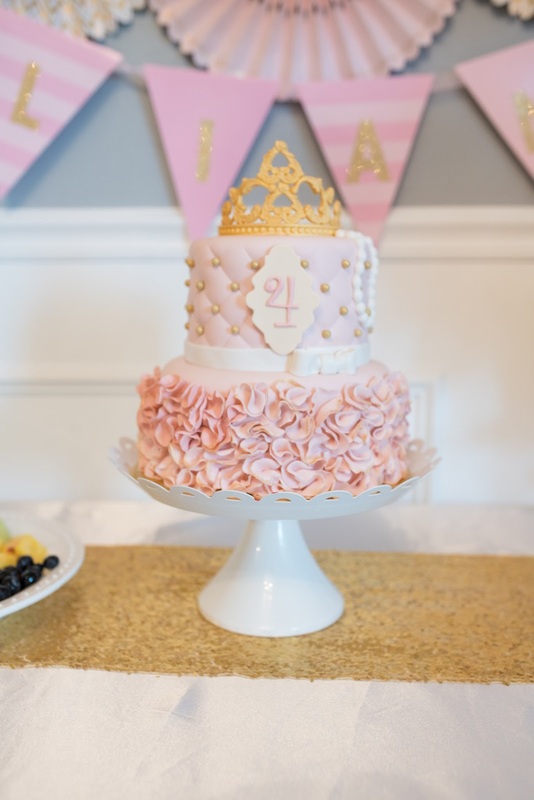 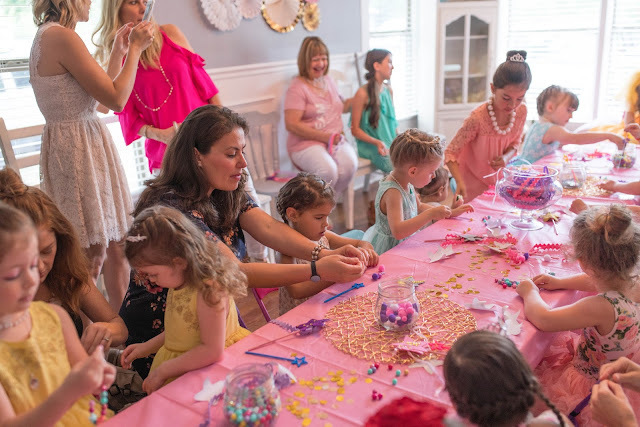 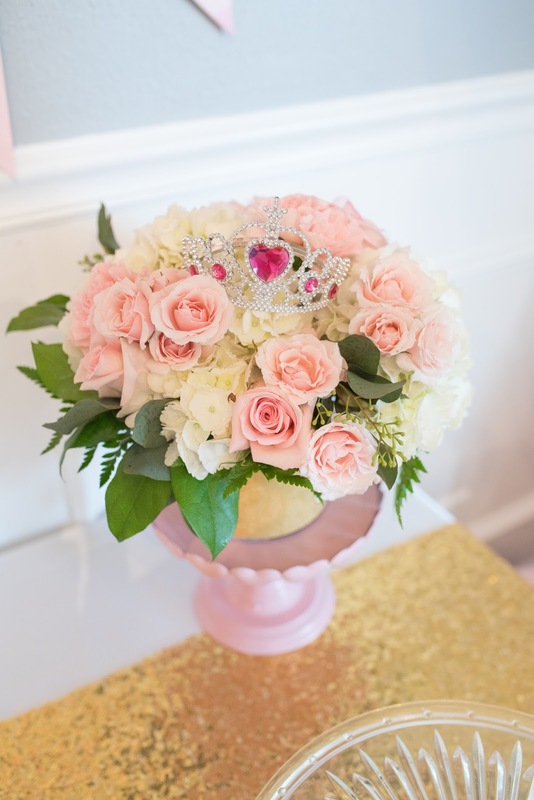 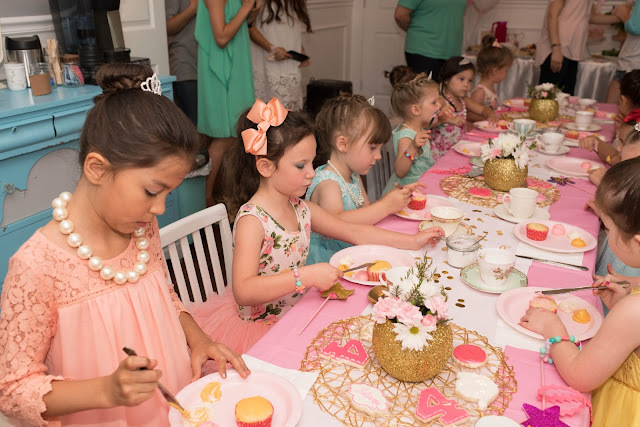 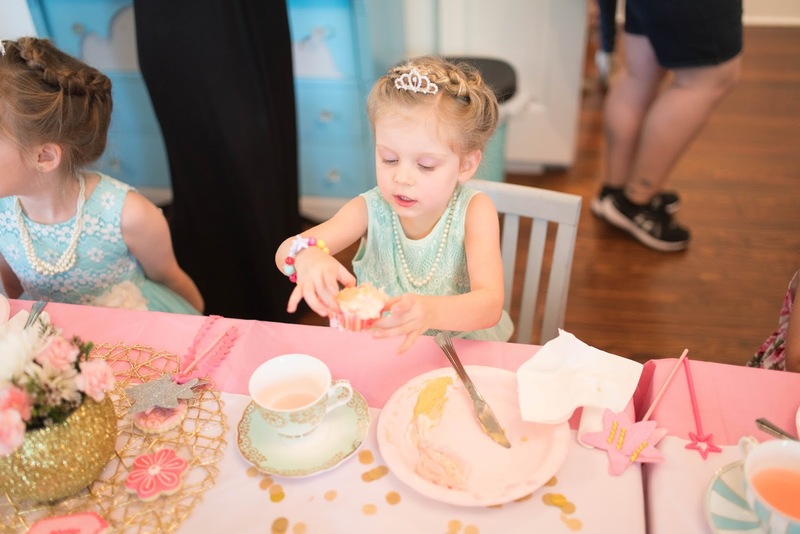 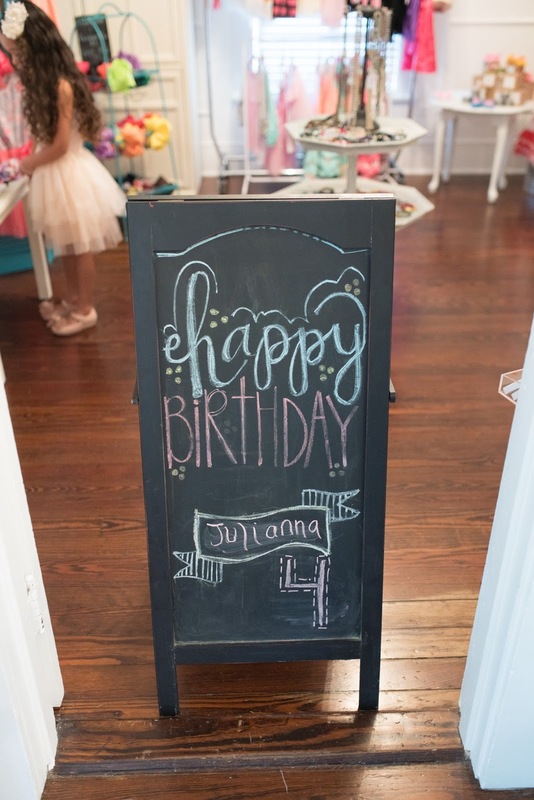 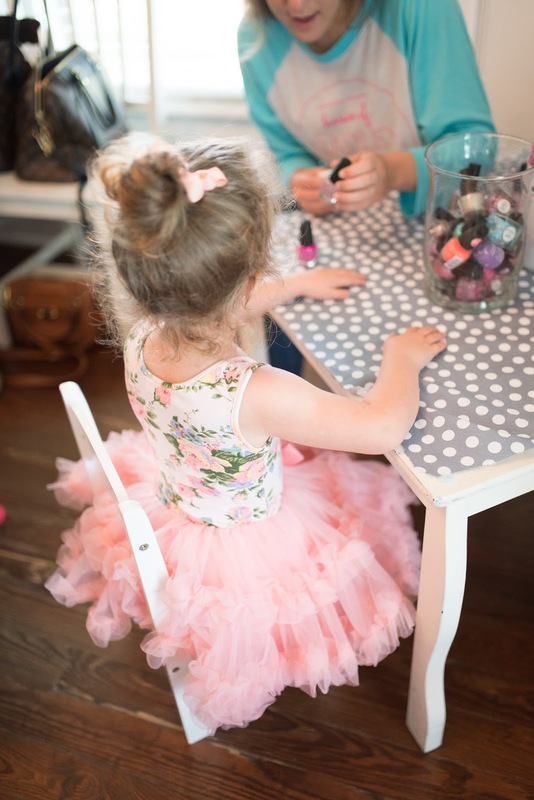 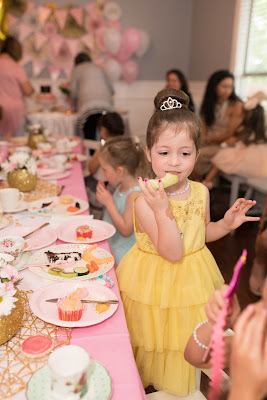 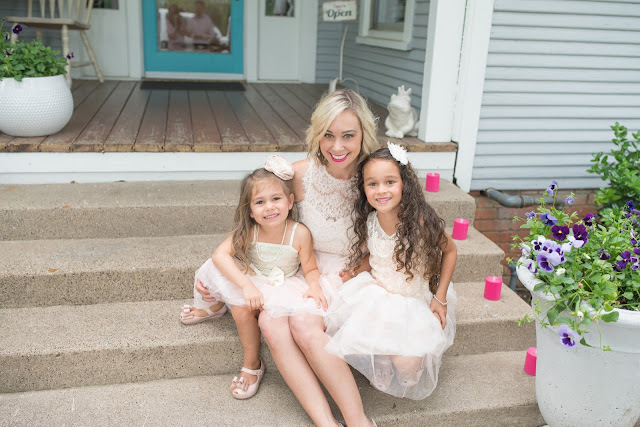 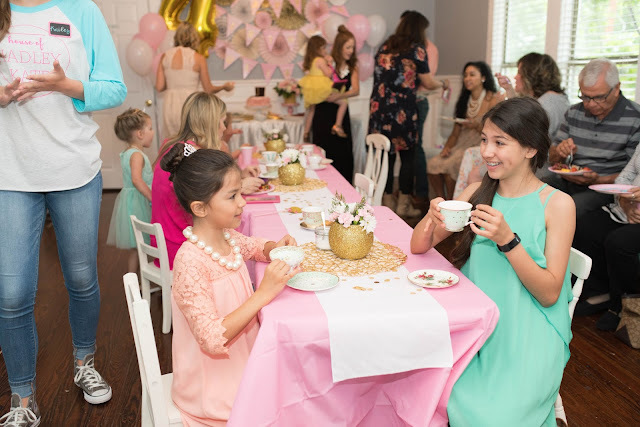 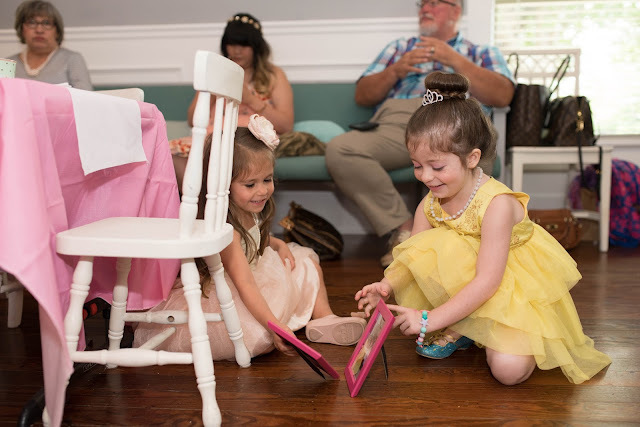 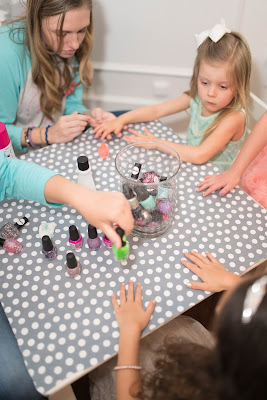 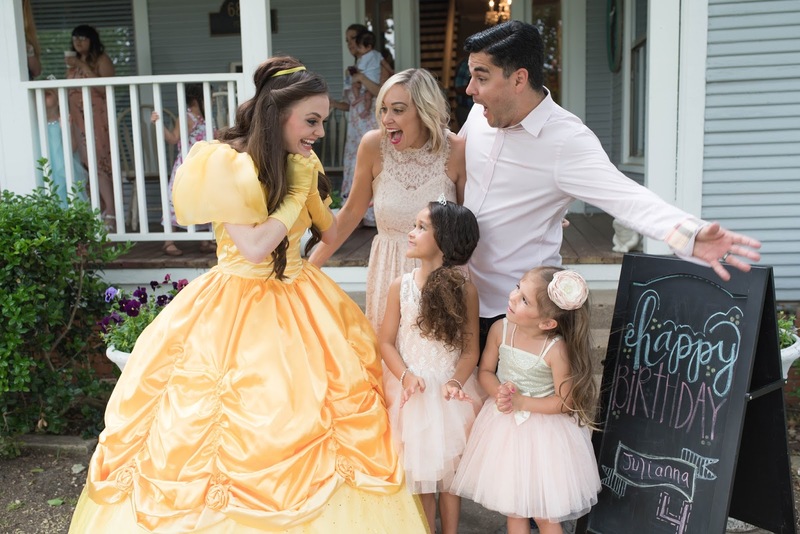 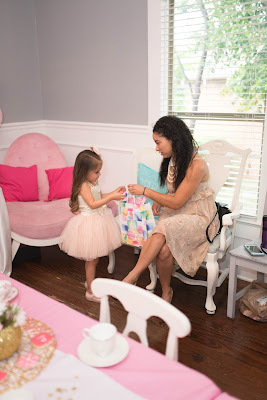 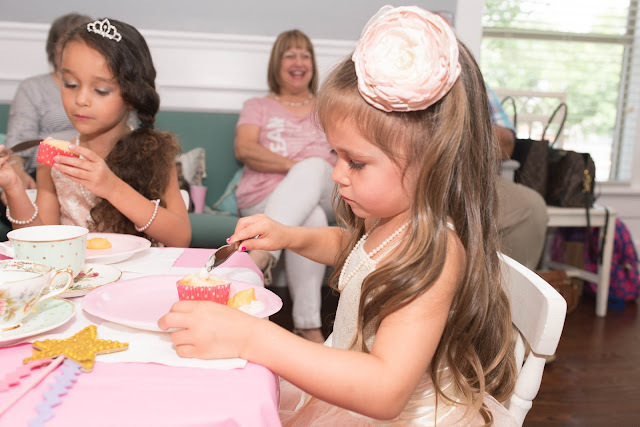 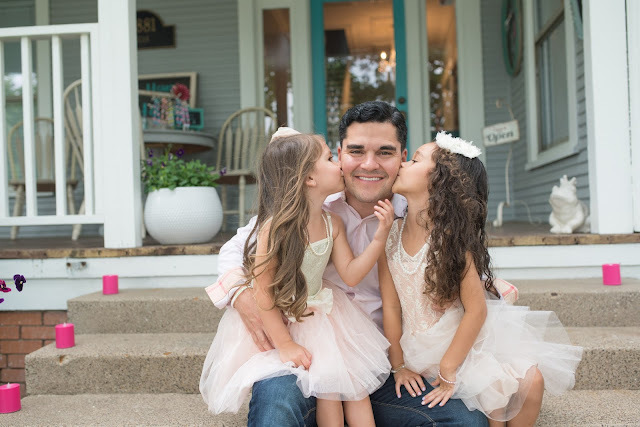 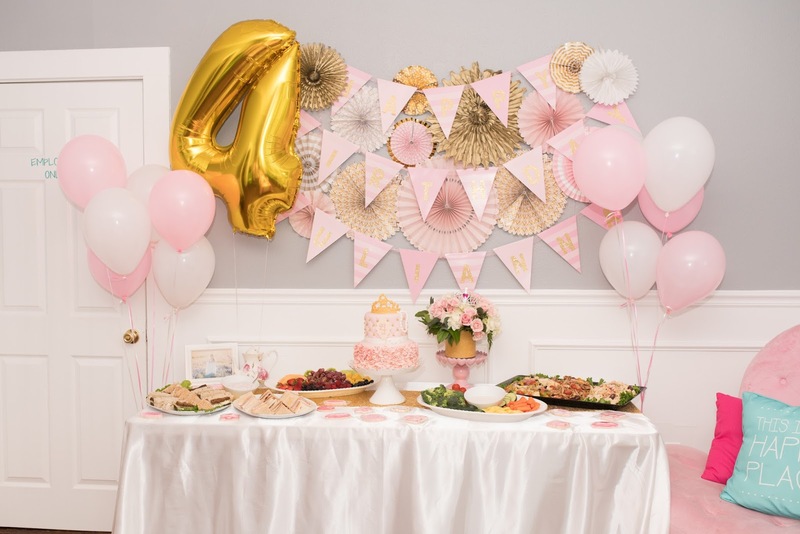 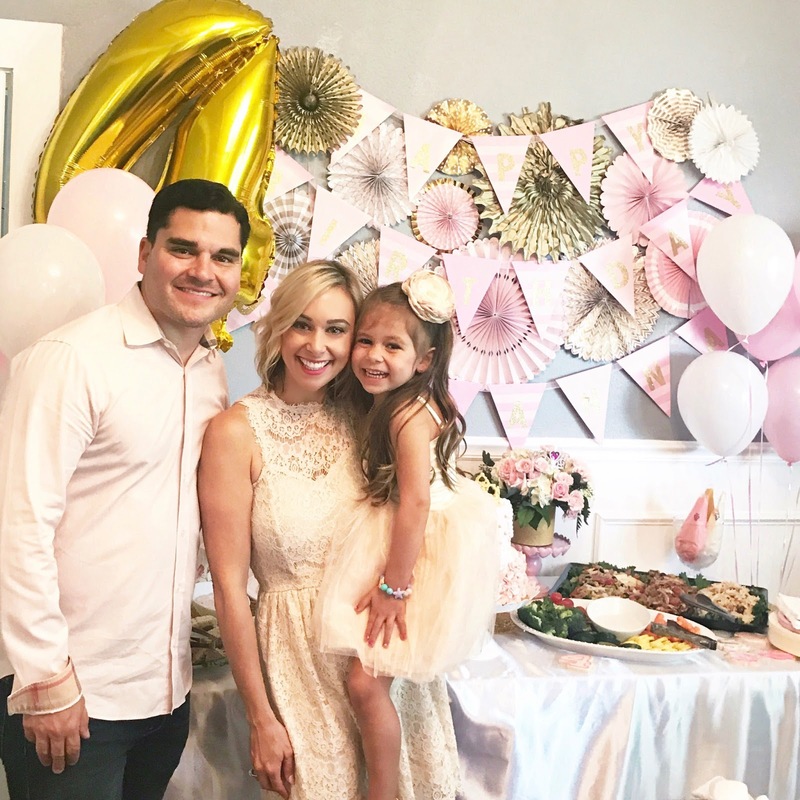 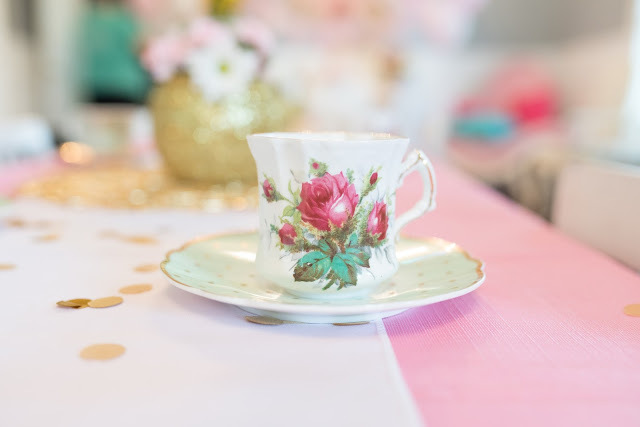 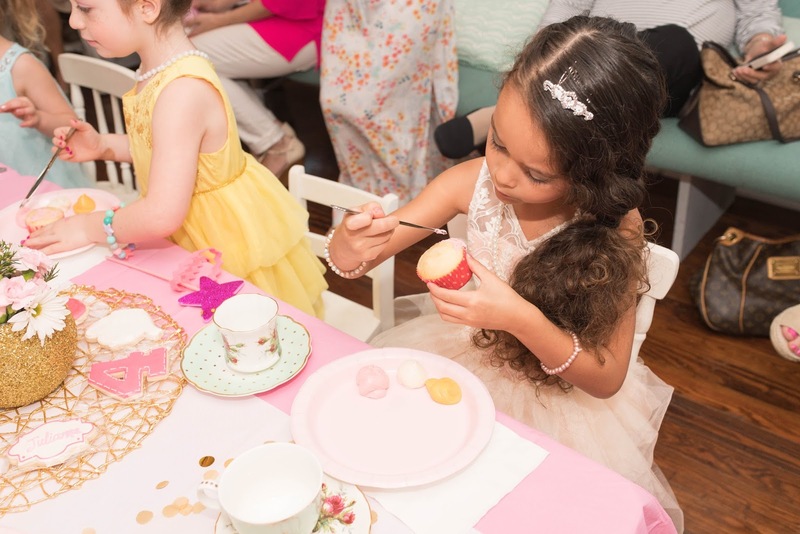 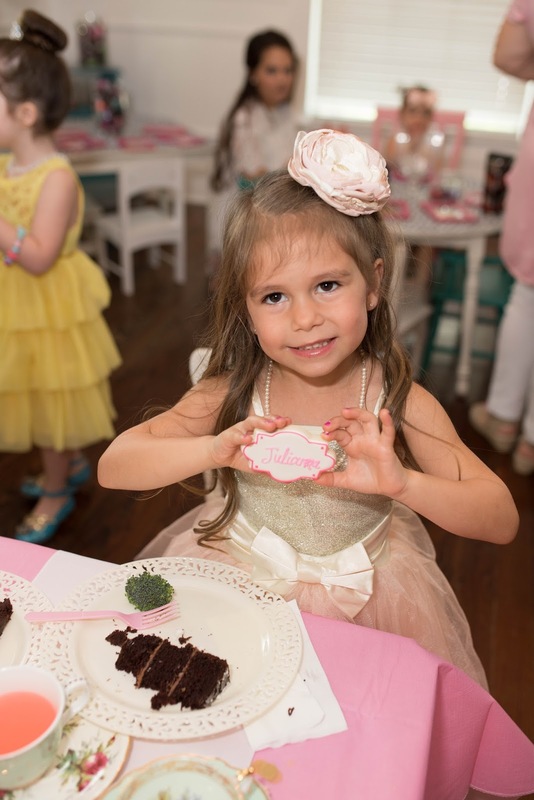 Last month we celebrated our sweet Julianna's 4th Birthday with a "Princess Tea Party"
I still can not believe our little Jewel is 4 years old! 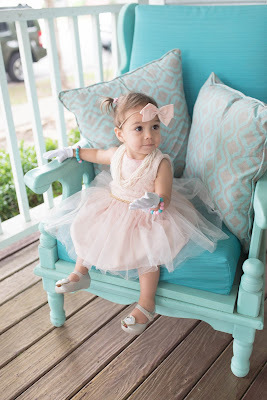 She is all things girly, such a little helper and she is our cuddle bug. When I asked her what kind of birthday party she wanted, she said a "princess tea party" so that is what she got! 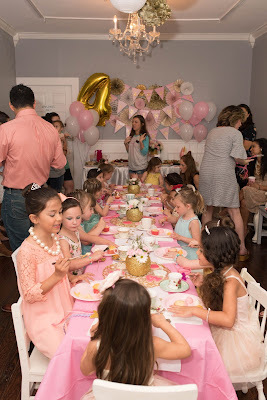 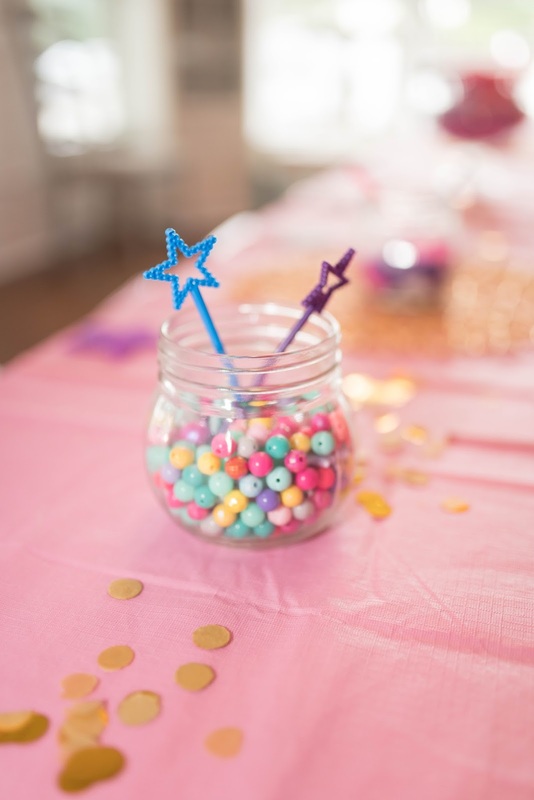 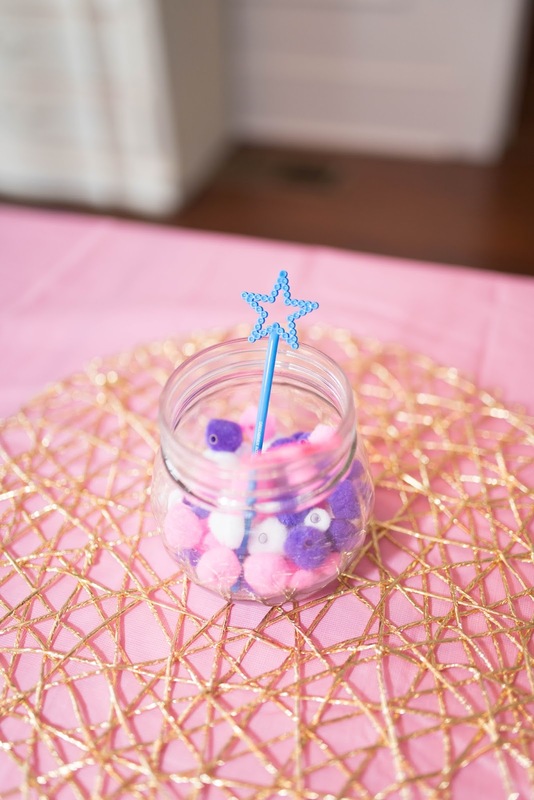 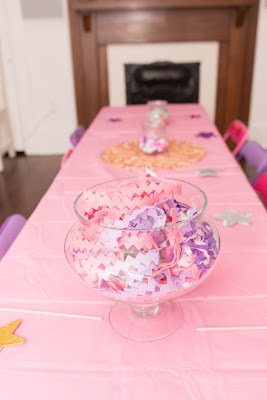 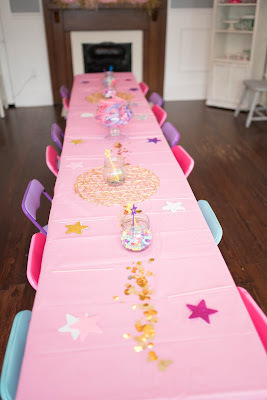 I almost did not do a "party" because Julianna's birthday gift was a trip to Disney World, but if you know me then you know I am a sucker for a cute themed party. 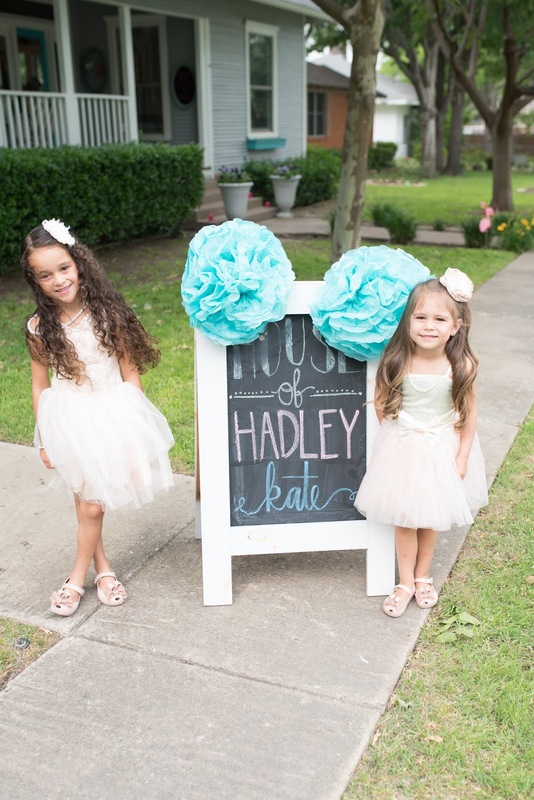 I found the cutest little party house here in Frisco, TX called the "House of Hadley Kate". 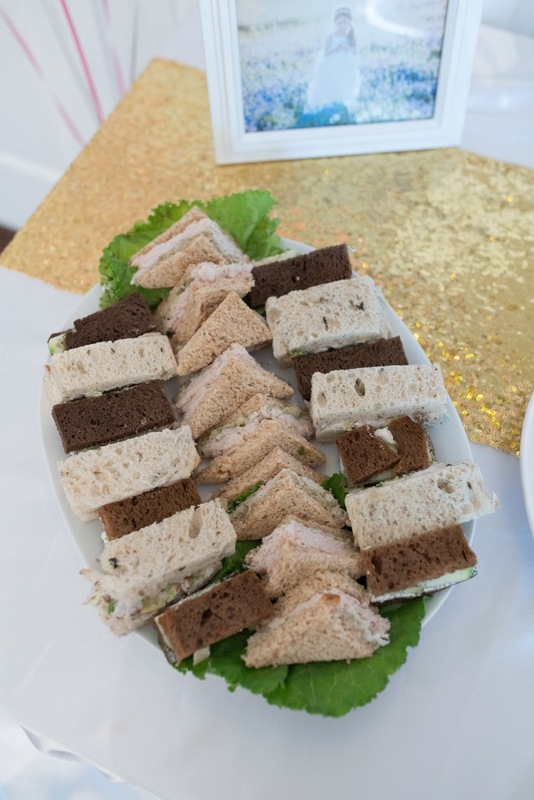 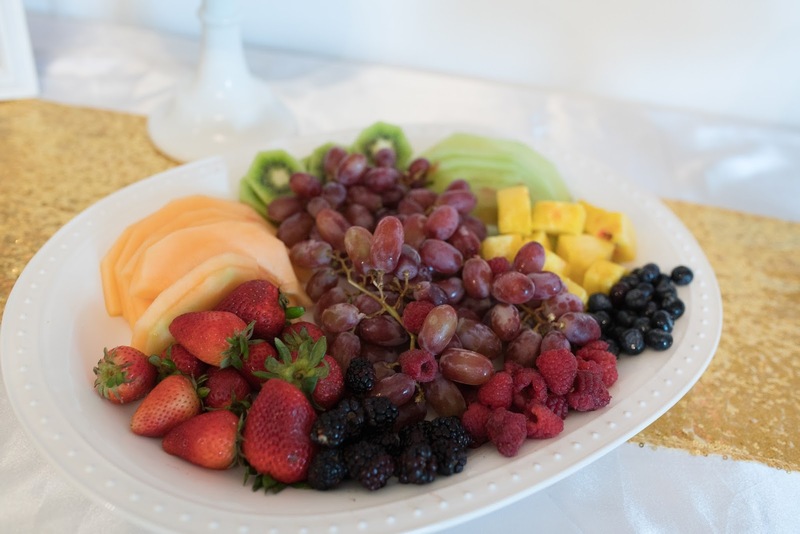 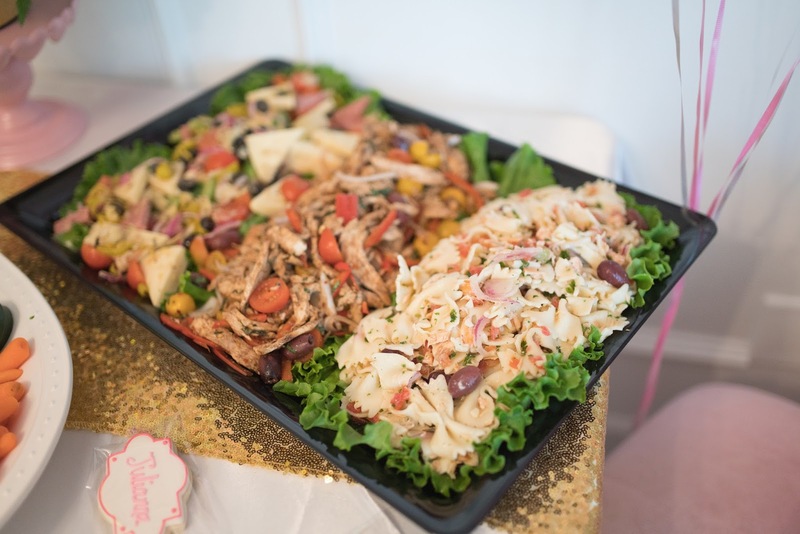 They do the whole party there and provide literally everything except the food & cake. 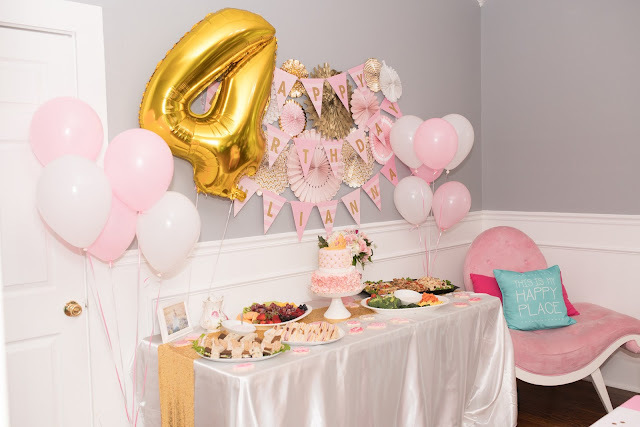 So to be honest, this was by far the easiest party we have ever done yet it still looked adorable and custom. 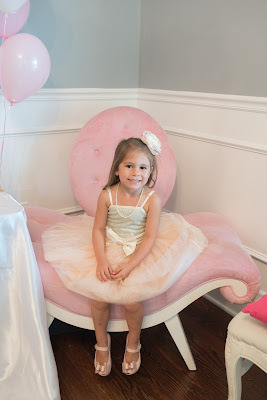 I decided to go with baby pink and gold for the colors because Julianna wanted to wear a pink fancy dress haha. 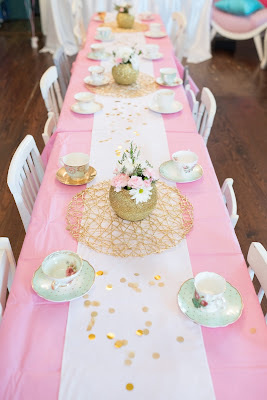 The colors looked classy and simple! I found some cute floral arrangement ideas on Pinterest, so I sent the pictures to the fabulous ladies at the House of Hadley Kate" (HOHK) and they used their floral designer to do the arrangements. 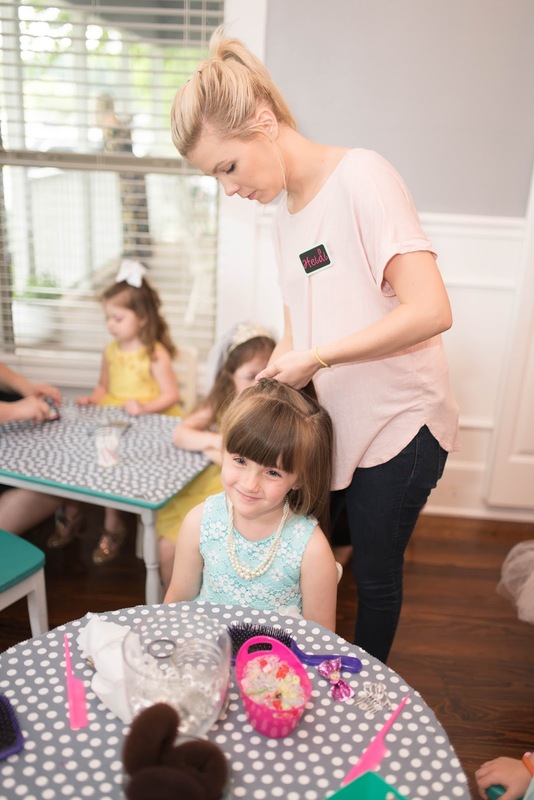 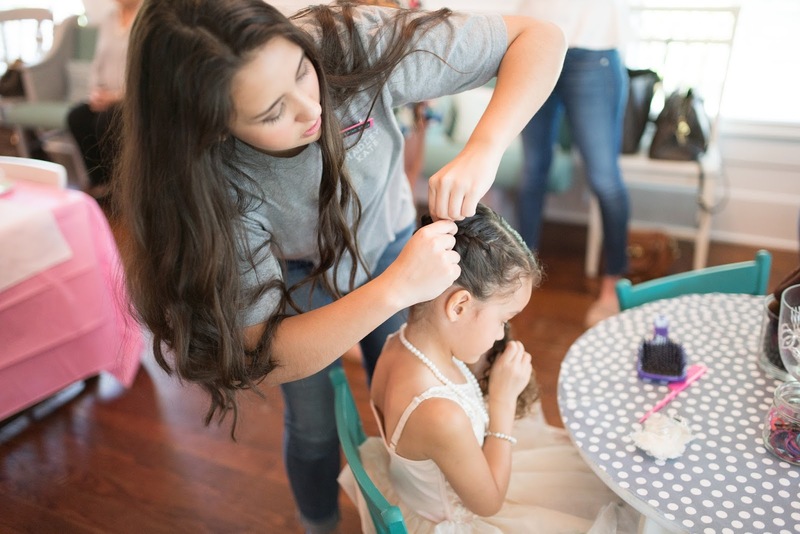 The kids arrived and they immediately got pampered with makeup, manicures & fun princess hair-do's. 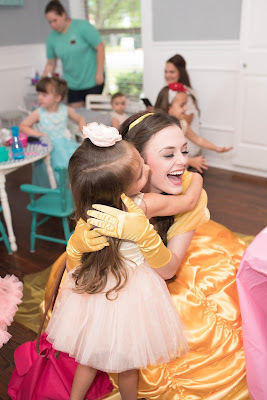 These little girls LOVED every minute of it! 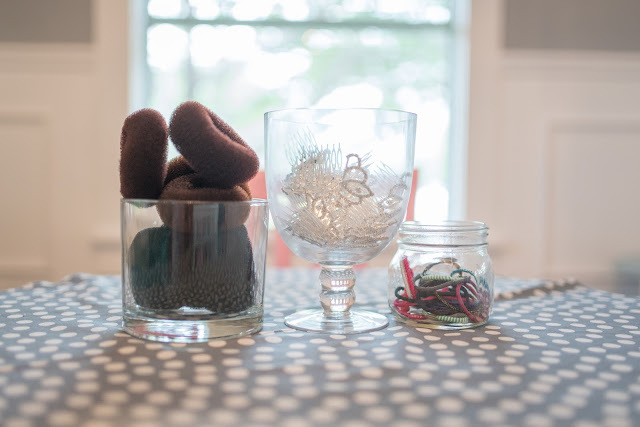 Crafts are included when you book with the HOHK. So they had bead bracelets and necklaces for the girls to make as well as princess wands. 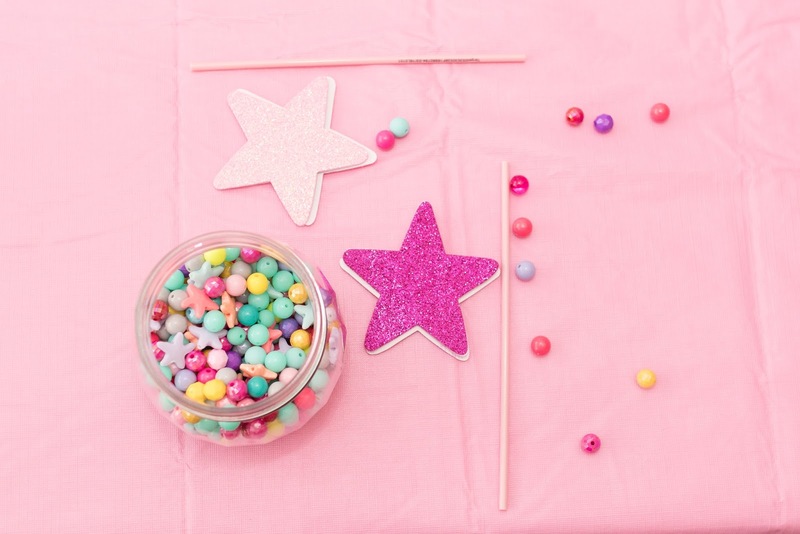 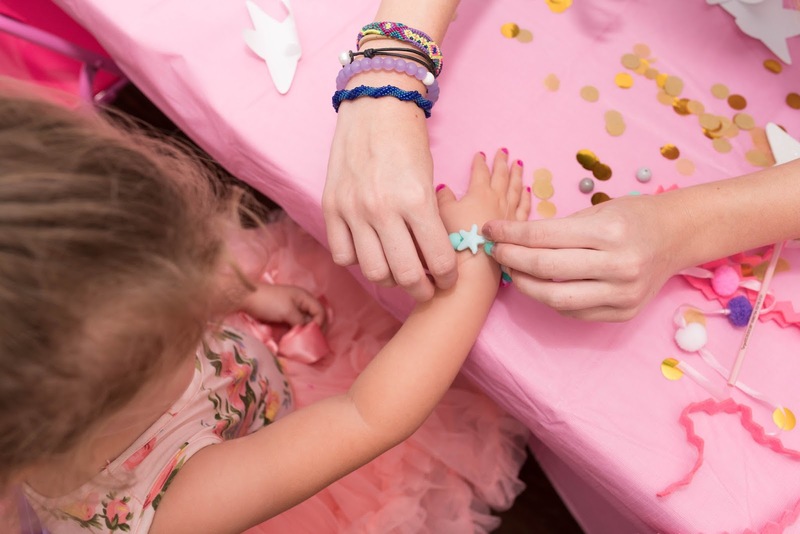 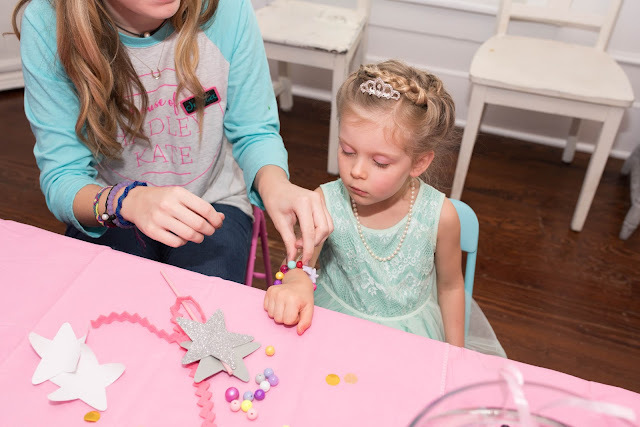 The girls had a blast making accessories to go with their party dresses. We had a special surprise guest pop in for the birthday girl! 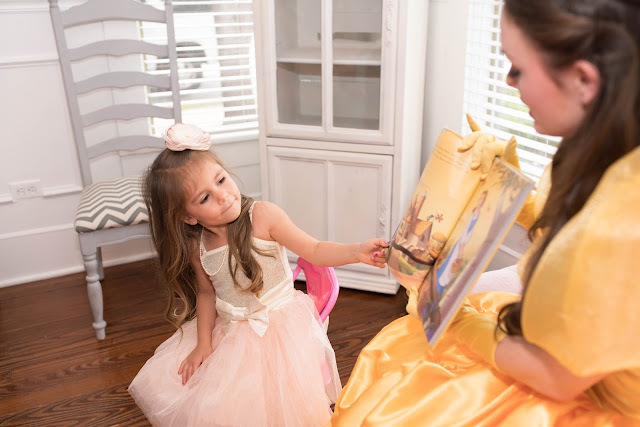 Princess Bell showed up to read her a story and sing a special song. If you need a princess I strongly recommend Heidi Hood from www.heidihoodmusicandentertainment.com. 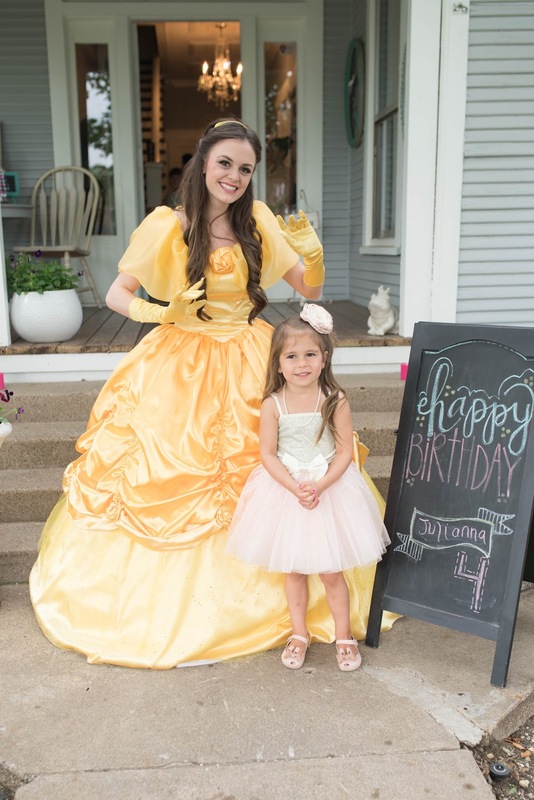 She was AMAZING and should honestly be a princess at Disney World or performing on Broadway! The girls were in awe of Princess Bell and she really was the cherry on top at this tea party! What do you drink at a tea party? 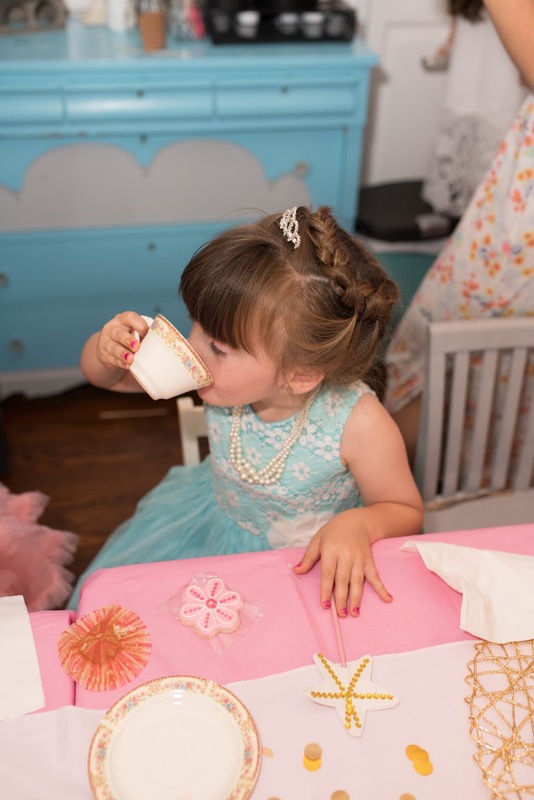 Tea of course! 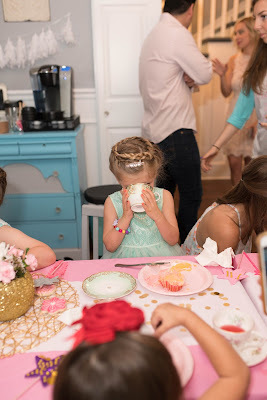 Well... unless you are 4 and then you have pink lemon-aid. So we served both, but I think all of the girls enjoyed the pink-lemonade. 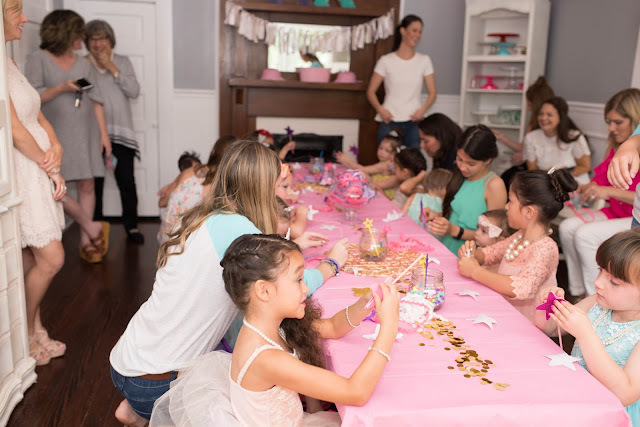 The amazing HOHK provided the party favors which were the most adorable picture frames with a photo of all the girls and Princess Bell. 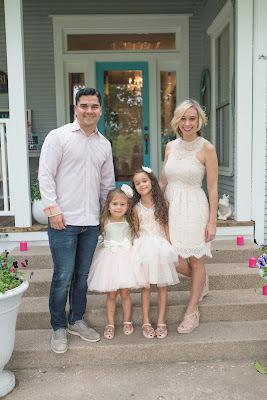 They kids just loved them. 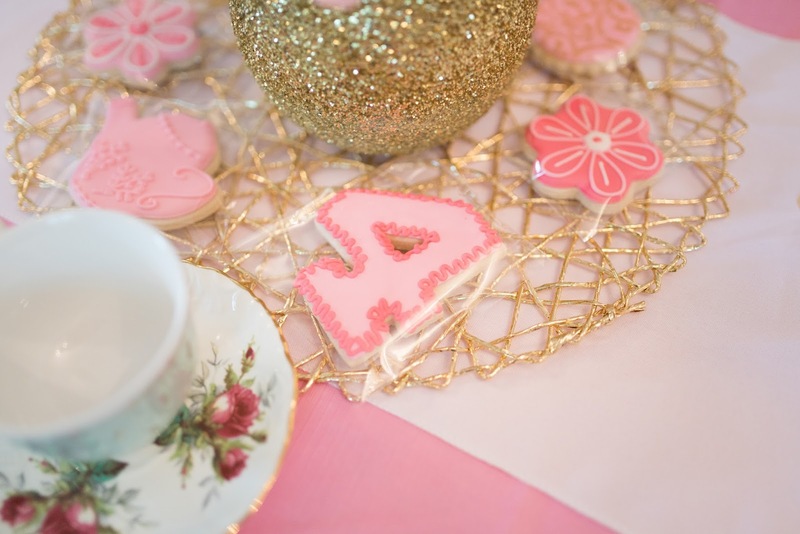 I also found some precious tea party themed cookies on Pinterest and of course the HOHK was able to get them from a vendor they use and I loved how they turned out. We are truly blessed with the most incredible friends and family. It truly does take a village to raise a child and our village is as good as it gets. 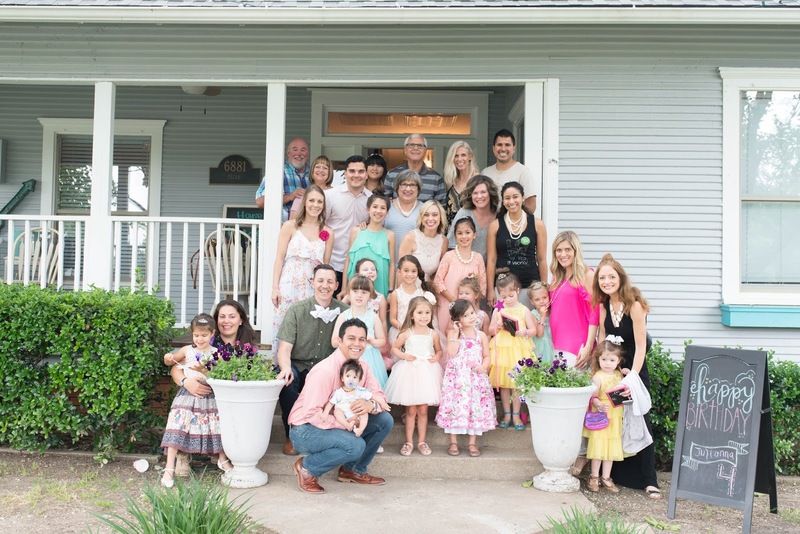 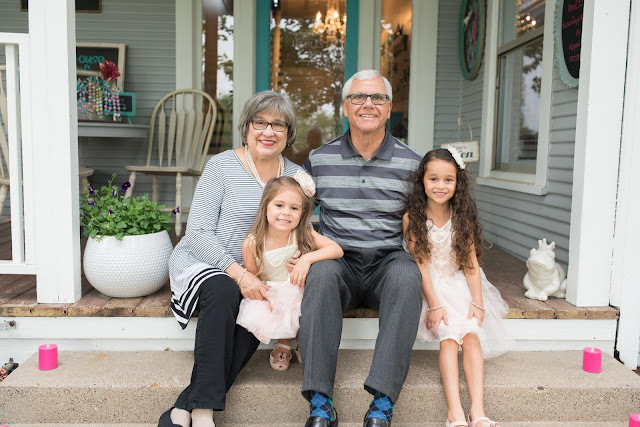 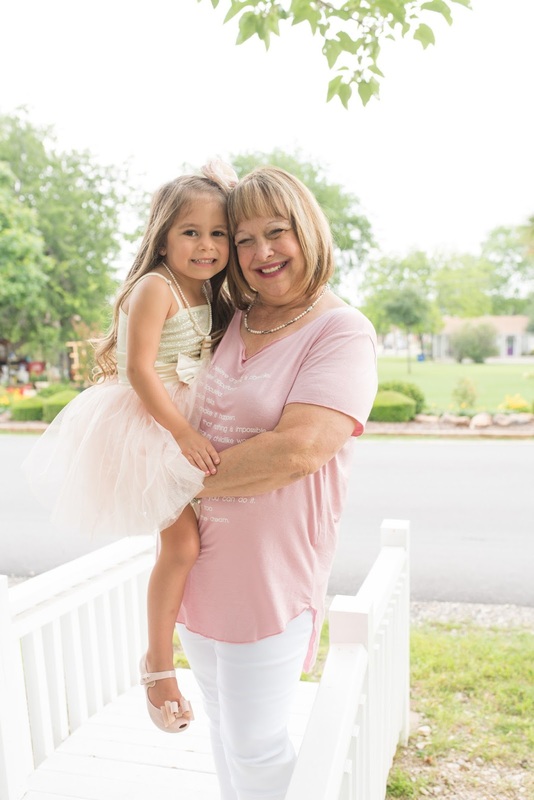 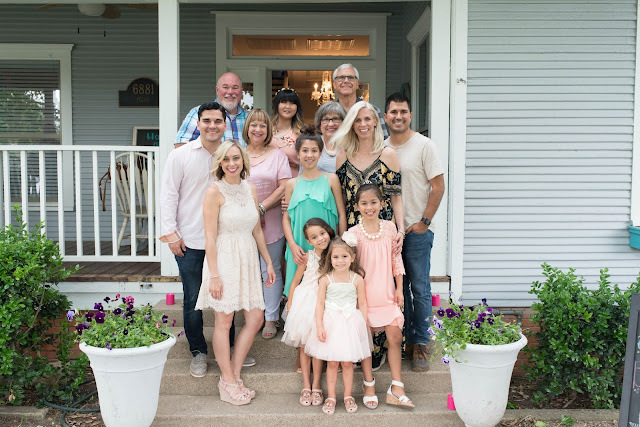 little Jewel has the best grandparents, so many amazing Aunties, her cousins are her best friends and the Lord has given her some of the most precious little girlfriends. 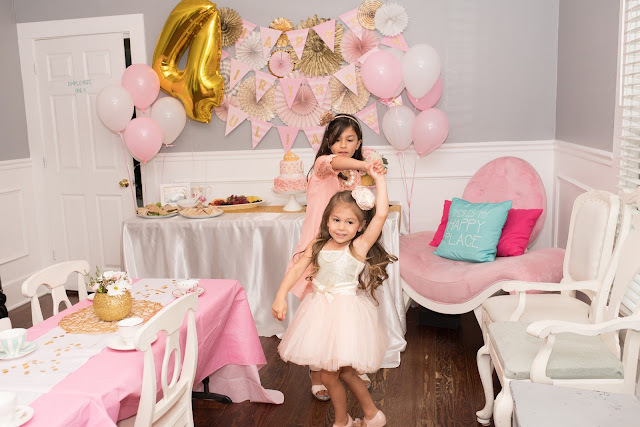 I am so thankful for everyone who took the time to celebrate our precious girls 4th Birthday with us. 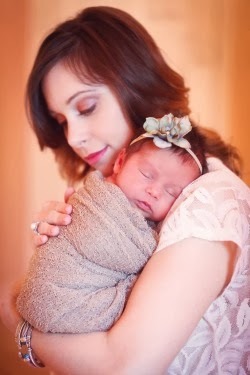 Julianna you are a world changer baby girl! 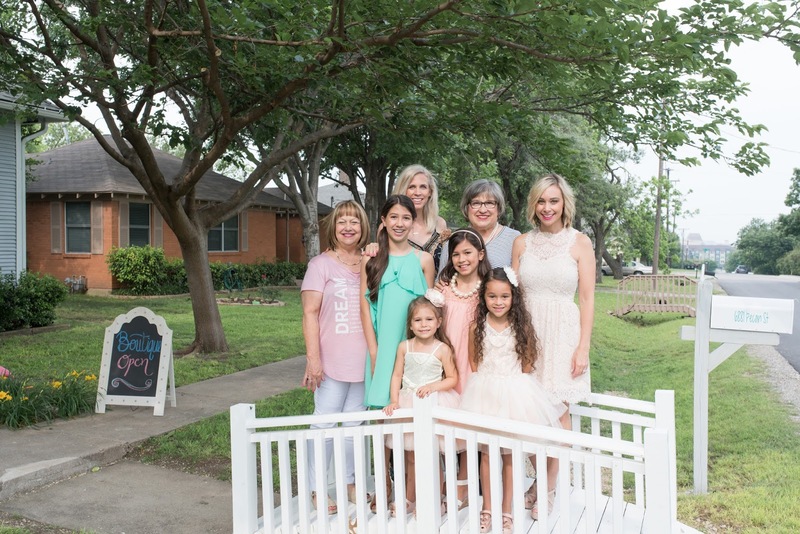 We can not wait to see what the Lord has in store for you. And though you be but little, you are fierce! 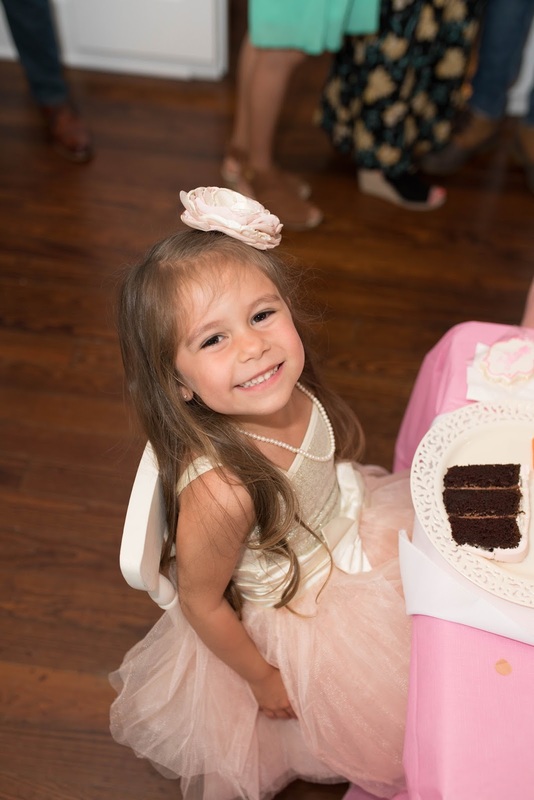 I have no doubt that you will move big mountains one day. Happy Birthday my precious Jewel. 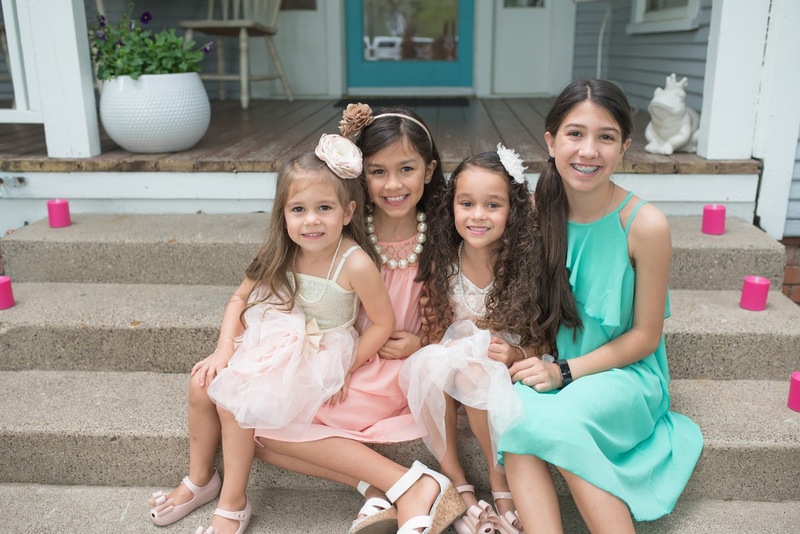 We love you endlessly. I have been to this place several times. 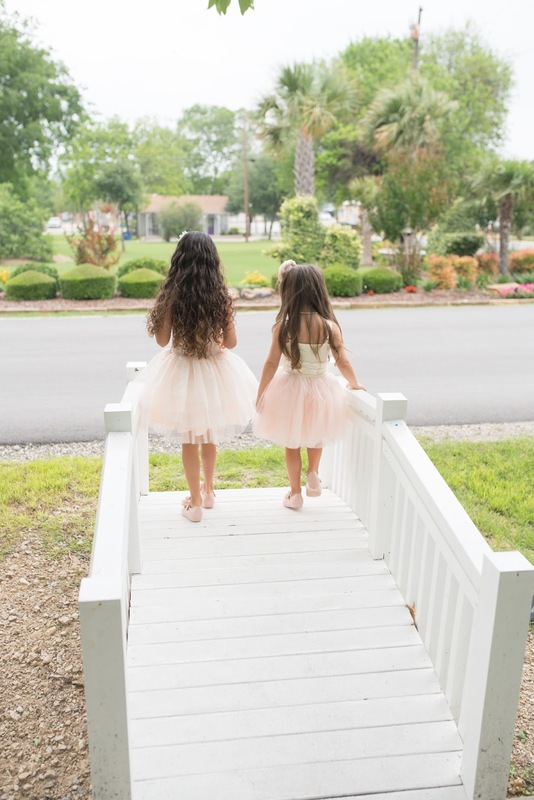 The perfect event starts with an extraordinary location, like this. 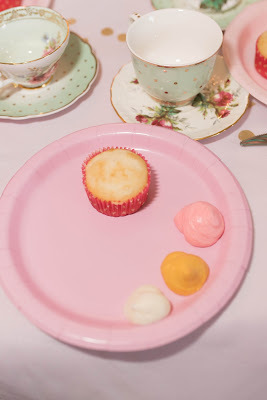 Thanks to my friend for introducing me to these Chicago venues. I will definitely be coming back.